— Screw on blank attachment and tighten (manually). — Fill magazine with blank cartridges and Insert magazine. — Set selective fire lever at "E" or "FM. At Interruption or cease of fire the weapon is to be locked. When regulating the gas outlet the magazine has to be removed. — Turn the nozzle bolt by means of the cartridge case bottom. — Position "screw slot transverse to firing direction" gas outlet "minimum". — Position "screw slot alongside firing direction" gas outlet "maximum". — Extract G3 magazine and breech block (note para 2.2.2.). 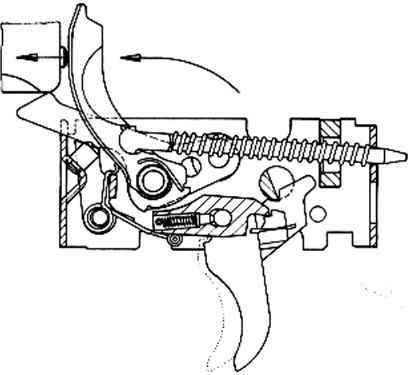 — Insert plastic training breech block in the rifle. — Check proper assembly of the rifle by making several loading movements. — Fill the magazine with plastic training ammunition and insert magazine. — Set the selective fire lever at "E" or "F"
When the fire is interrupted or ceased, the weapon has to be locked. Note: Owing to dimensional differences it is impossible to fire NATO cartridges cal. 7.62 mm x 51 with the plastic training breech block. — Insert subcalibre tube E in the G3 barrel from behind. The bore on the face side has to point downwards. 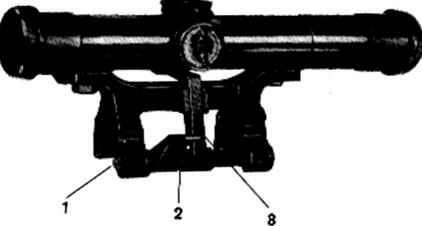 Check proper fit of the subcalibre tube E by inserting the magazine E.
— Insert bolt E into the receiver. — Check proper assembly of the rifle by moving the loading lever several times. — Fill magazine E with subcalibre ammunition and Insert magazine. — Prior to the mounting, turn the claws (59/1) of the mount outwards. — Place mount on the rifle from above, tilting the mount slightly to the right so that the plastic nose is adjacent to the sight cylinder. Note designations "firing direction" and "arrow". — Press tension lever (59/2) downwards until the catch (59/3) engages audibly (Fig. 60). — Turn tension lever upwards. To remove the telescopic sight with mount, turn tension lever downwards. Press catch downwards with the thumb (Fig. 61) and turn tension lever upwards again. Tip the telescopic sight with mount off the weapon to the right. For putting the telescopic sight into tho carrying bag. turn the claws accordingly to the inside. 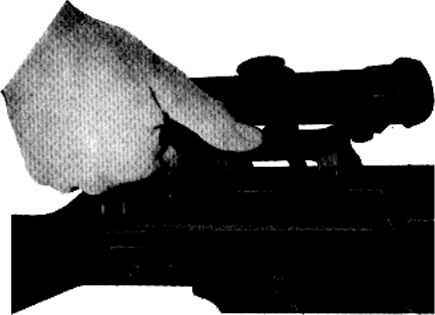 When using the Rifle G3 as aiming- and observation device with infra-red spotlight, the mount has to be placed on the receiver of the weapon. 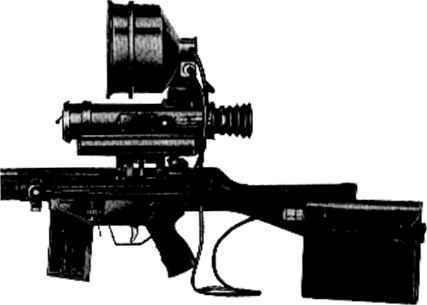 The infra-red night sighting device with mount is on principle attached In the same way as the telescopic sight with mount. In addition, the press-button switch with its holding device is fastened on the weapon according to the desired firing position, so that it can easily be operated with the left hand. The infra-red night sighting device with mount Is on principle detached In the same way as the telescopic sight with mount. No special treatment of the weapon is necessary In case of dampness, great heat, and cold down to approx. - 40° C.
The rifles, training equipment and optical sighting devices are not to be taken from the cold into the warmth and a little later into the cold again, since otherwise the functioning of the weapon will suffer because of moisture, sweat, ice formation and rust. — guarantees readiness to fire. — after each time the weapon has been used, causing no main cleaning. After each cleaning and assembly of the G3 it has to be checked with regard to intactness and perfect function.